The HSS seems voiced for the journeyman player who needs to cover extra rock-edged ground. A great HSS bolt-on, but there’s plenty of choice from other makers. 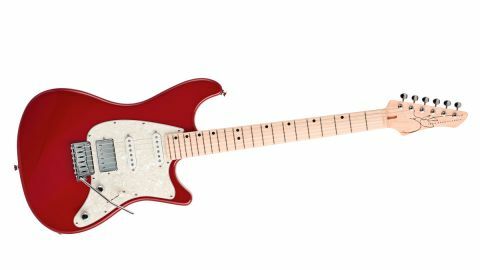 It’s little surprise that Fender’s classic bolt-on designs are the platform for considerably more than half the new guitars made today. There are plenty of pretty direct copies, aided by a parts business that seems to be growing yearly, often aged and relic’d to look like vintage pieces: all ‘better’ (so we’re told!) than the originals. What there is much less of, though, are more forward-looking, modern designs that might be based on those originals, but are clearly far from copies. John Page’s Classic range falls nicely into that latter category. No prizes for guessing where this guitar originates, but no-one is going to think you’re playing a Fender. The now eight-strong range centres on the original Strat-inspired Ashburn, of which we now have six versions, including one left-hander and a limited-edition model, and a pair of AJs. These include the 2017 additions: our Ashburn HSS and Special, while the second AJ comes in a similar Special makeover. Outwardly, like 2016’s Ashburn HH, the HSS is simply a pickup configuration change utilising a Bloodline by John Page vintage-style humbucker in the bridge position combined with a pair of JP-1 single coils. This model features a body shape that reduces the treble horn and opens out the cutaway a little, but otherwise the geometry is pretty similar to a Strat and, strapped-on, it feels like one, too. The number of subtle tweaks, however, give these Classic guitars their own feel. First, there’s that biggish, quite full-shouldered neck shape and flatter fingerboard radius. The heel is rounded and the neck bolts to the body, each bolt connecting to a nut inset in the neck. Fender’s 2017 American Professional range includes the standard three-single-coil Stratocaster, the Strat HSS Shawbucker and the Strat HH Shawbucker (all £1,399 with maple fingerboard; £1,429 with rosewood including a lightweight moulded case) with a raft of upgrades including new V-Mod pickups. Music Man’s three-single-coil Cutlass is its take on the Strat, while the Stingray features a similar platform with dual humbuckers. Expect to pay £1,779. While PRS is yet to take the wraps off its rumoured three-single-coil bolt-on, the twin humbucking (with coil-splits) CE 24 Satin kicks of its bolt-on range with street prices around £1,500. Vigier is another home for modern-style bolt-ons such as the Expert Classic Rock (£1,649). The HSS uses a two-post Gotoh 510 vibrato with steel block saddles and rear-lock vintage-style tuners with staggered height posts. The HSS uses 500k pots, a .022 microfarad cap plus a cap and resistor treble bleed circuit, and there’s a pull/push switch on the tone control that splits the humbucker voicing its slug coil. It also ditches the dished output jack plate of the Strat for a thick metal side-mounted plate. Of course, the HSS’s bridge ’bucker laps up the crunch on show here. It’s quite old-school, lightly potted and with a DC resistance of 8.18kohms, and excels at those modded late 70s rock sounds. For many players, it’ll be a perfect combo without touching the coil-split or the single coils. Further subtlety comes with the HSS’s treble bleed circuit, which is nicely chosen, retaining the crisp highs and losing a little mud as you turn down. It doesn’t feel like the HSS is just a standard Ashburn with a bridge humbucker, for example: the guitar has its own character and voice. As we concluded in our most recent review of the AJ, the Classics have a serious ‘working guitar’ pro spec and feel about them.